The test server has just been patched and oh my goodness things are going to need testing. This patch not only introduces 20 new scrolls but also makes changes to many of the current scrolls that we have right now. Added Black Market, accessible from the Store. This feature is still work in progress - will get limitations (such as number of transactions), as well as a better system for collecting profits. Added a first iteration profanity filter to the chat. This will likely need tweaking - please help test it! Added the first 20 scrolls from Waypoints (set 6). Rarities are not yet set for these scrolls. The black market scroll browser sorts things in the wrong order." Stats button does not work on scrolls in the black market. Monstrous Brood can no longer target structures. Will the new PoR prevent any damage? Including poison? Is the number of units required for the scroll draw including or excluding the partisan? Should Leeching be a trait? Royal inspiration: Isn't 4 cost massive for a scroll draw? Very, very nice that the dev's give the marked and trading some more fetures! Looking forward to that!! wish this patch would download faster! Wow...this will take a long time to figure out what is good and not good. I'm not all that sad about losing blightbearer. All we need is another 3-2-4 3D creature, even vanilla, and it might replace him pretty well. 5 cost is still pretty extreme though. 4 might be reasonable with the decent stats and the poison ability that turned out to be more good than a drawback in many decks. And the poison change... I don't really get the point. I thought the old system with "basic" poisons lasting 3 rounds was nice. Without going for the full poison deck you could drain 3 life, but with miasma wells and curses you could pretty easily kill even the strongest creatures in those 3 turns. Now poison will be very good in any deck unless it is countered by magic armor. Brain Lice was already an autoinclude and now it's just insane. Rangers bane might start to see a lot of use too. EDIT: Talking about creature stats, I don't see Blade husk being 5 attack do anything to it's usability. But if the change would have been +1 health... now that is a big upgrade! I greatly agree with you on the poison change, seems like poison decay will be 100% go after this update. I really like some of the growth changes, skythorn set to 4 is definite needed change, and along with the new growth structure card I might try and get a structure growth/decay deck started on. Very pleased with all of the new scrolls, I think this game needs more variety, different types of scrolls will definitely do that. Looks like scrolls is changing for the better! Good work on the test server update! Hope to see what comes up next! What do you guys think, is a non-poison Decay deck gonna be relevant after this patch? I approve of all the new scrolls. Hopefully they increase deck diversity (Snargl has anti-synergy with Energy removal, for example). Always good to see more utility scrolls with clear counters. It's good to see that Mojang is putting more thought into the rarities this time around instead of just making the powerful cards rares like usual.... 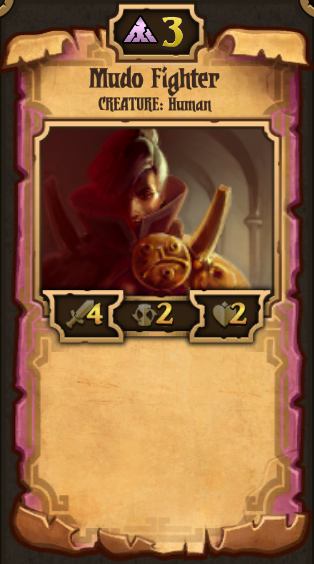 Ideally, any cards that are intended to be faction staples should be common, and any cards that you never ever would possibly need 3 of should be rare. I don't think it was changed all that much with this round of updates. Blightbearer is unusable but easily replaced and hunter had a small nerf. Brain lice is buffed even in normal decay, they can use the slithering form to counter structures and the anima conduit seems pretty nice. 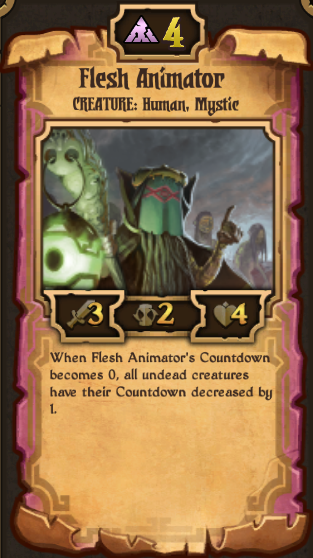 Undead are also getting a buff, and maybe with the rest of the set it might become a thing. with machine priest now adding automaton attack, energy is going to get out of control between it and scout automaton. i do like echomaton being back to usable again, hilariously rampy as it be. good to see decay getting some undead support, and same with growth and beasts--a worry though: with the new vaettr beast decks are going to go completely nuts (being able to flood the field with cheap drops hilariously easy--hello owl/ragged wolf for easy aggro). those without area removal (coughordercough) are going to get stomped flat. 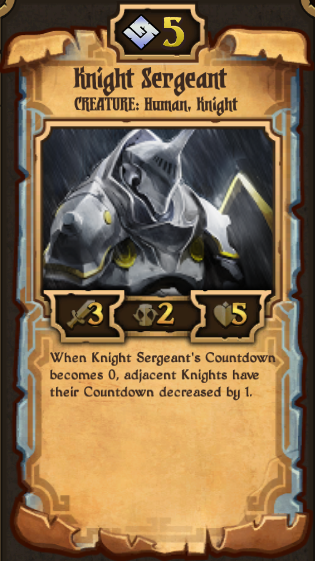 speaking of order: nice to see the new knights--though i wonder why one would run knight sergeant over honorable general at all, and aerbalist is nigh useless unless you've got lots and lots (and lots) of ramp and cantrips to keep him even mildly useful--which kicks deck variety in the nuts. i'm sure having a needlessly specific eye of eagle will be helpful to order... somehow. wings sorceress will def help against enchant growth and poison/curse decay. From a couple hours of gametime, anima conduit is crazy useful. Revenants and conduits interact really nicely with restless bones, watchers, harvesters, stitchers, constructs, necro, witch doctors, rot-eaters and to a lesser extent damning curse. They give decay a lot of explosiveness. The buff to blade husks attack is more significant than it appears at first glance. With flesh animator making undead and restless bones better the blade husk is much stronger and much more reliable. I don't think he should've gotten the attack buff as he was buffed indirectly alongside all the other undead. I spent most of my time with decay so far but also a little bit of growth. I really really really like the changes to urhald, kinfolk jarl and especcially mangy. Skythorn change is pretty decent giving 1 card about every other turn or so. Nogs are neat.. another kinfolk ranger but for beast decks so thats good. The nest is kinda cool but overall is a worse, albeit cheaper, forge. 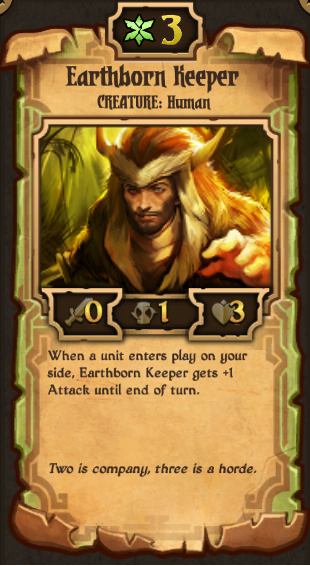 The Earthborn keeper is going to be really powerful in growth aggro if he is left as is. 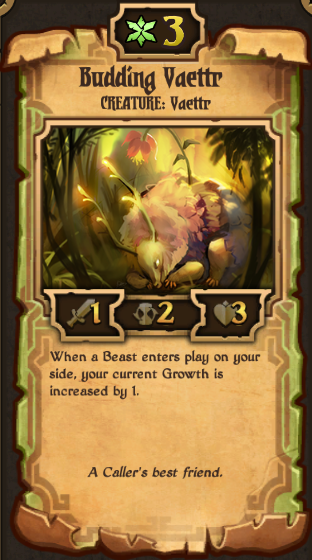 Not sue growth really needs another cheap 1 cd unit that can be easily buffed and jammed down your opponents throat prison style. Didn't play any order but did manage to get throttled by a lategame knight deck. The Arbelisker is awesome. His animation is stellar and his ability is quite unique. 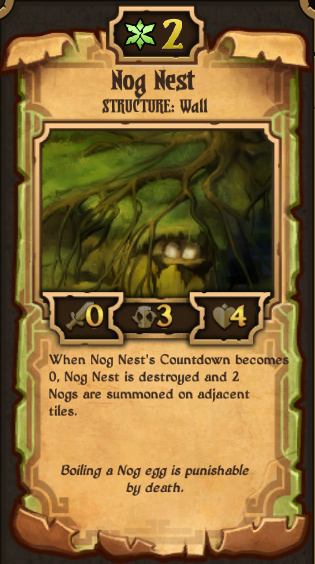 He counts down very fast, about every other turn with standard lategame order. I think he may need a reduction to 5 attack tho. 6 base seems high for piercing. With 5 attack he would hit 5... 2... 1 but would stay the same with a focus, which lets be honest, is going to happen a hell of a lot!... 8...4...2...1 vs 9...4...2...1. I have a distinct prediction about knight sergeant that Im not going to share at this point in time. These are just first impressions. Overall I really like just about everything. I think theres a lot of flavor and diversity here. I also think theres quite a bit of potential in some of these new additions. Will touch on energy later. Cay got health buff. probably the best of the uniques. snowballs card advantage and most importantly she has ward unless you play her like a jackass. The other 3 can be sniped for much cheaper than was spent to cast. This alone makes her better. Undead, Automaton, and Gravelock oh my . 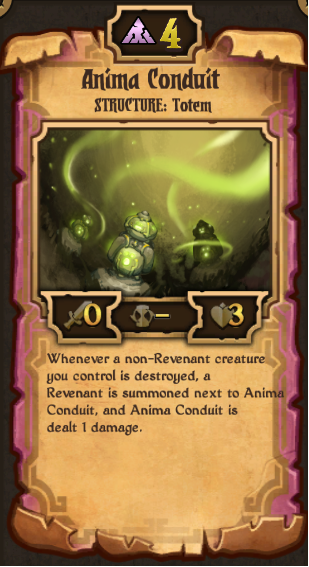 I still think blight bearer will be used personally though maybe 4 cost and 2 attack would have been the better change. Machine priest finally playable, I will probable use it in my automaton deck because good for buffing automatons and oculus cannons. Machine priest will also be interesting to see if destroyer can pull a comeback to competitive play as that used to be so good in the old splash for pother efficiency focus and transposition days. 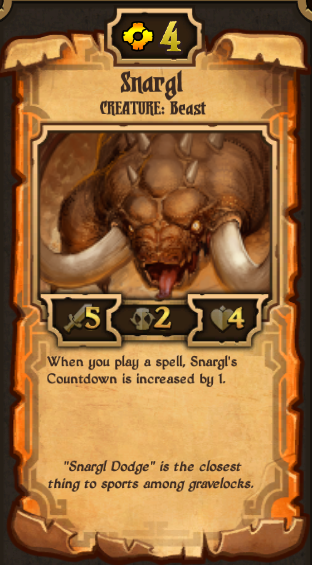 I love snargl just because i think it is great design, and that flavor text Also lockling brood very cool i love everything about that scroll. Pushing bunnies hard i see . 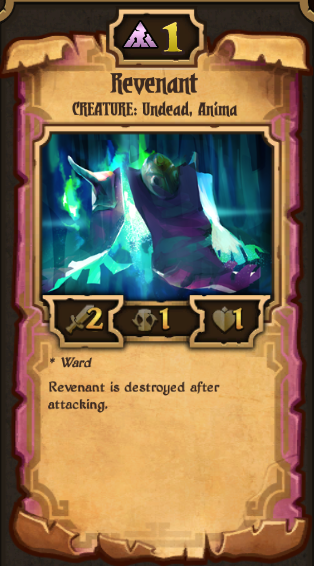 Revenant is going to be deadly, and i think will also be great in multi-resource decks to help the early game out (Multi-resource still needs some changing, but the current resource stuff might help.) The order stuff could be crazy resurgence of late game order? Quick couple of things love all of the buffs especially stitcher 3 health for a 4 cost unit is just too little (Echomaton is obvious exception) Surprised to see pest dissimulator go to 5 cost, but maybe new stuff coming out required the change. Anyway great job looking forward to the other news. I'm looking forward to playing around with these scrolls come monday. I see a couple of scrolls that probably should be changed, but we'll see after I've played around with them directly. 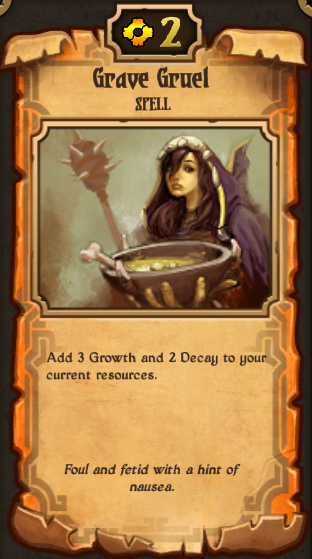 Why is it that only Energy and Growth really have flavor texts (with the exception of one order unit)? I don't like how Somata Sift reduces health to 2. I can understand some draw back, but this seems like a lot. Perhaps increase it's countdown by 1 when it comes in? Or keep how it is, but have CD set to 1 as well. 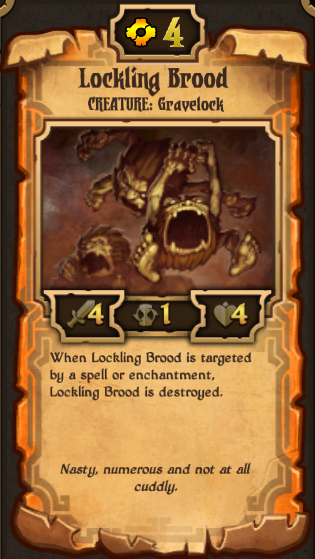 I love Lockling Brood. But I personally think that what with it's ability, price should be reduced to 3. I mean, it'll be lucky to get 1 or 2 attacks. I have to admit, I actually thought that the update a couple weeks ago was as big as single updates were going to get. Now this... anyways, on to my thoughts. 2/2/3 creatures: Up until this point Scrolls has gone without two identical scrolls with different names and animations. Granted, Kinfolk Ranger was just a weaker version of Tool Initiate, but at least they were different. 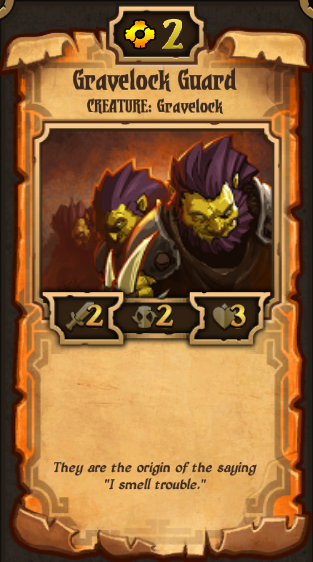 Now we have 3 identical creatures, 2 of which are even in the same faction. I hope this isn't a sign of things to come. Also worth pointing out that unless you plan to add Mach Mindset to it, Mudo Fighter is just a weaker Scattergunner. Blightbearer: Cost 5?? Really?? it was fine, and now the Poison change will throw every Decay deck into disarray. That said, give it a couple weeks and most people will have adapted. Corrode: It's like a mega super ultra potent Ire and Bile now I guess :/ seems a bit too good for board clearing, but I'll wait and see how it turns out. Death Cap Berserk/Overdrive: Am I the only one who sees the problem with reducing the damage now that Magic Armor's a factor? Death Cap Berserk in particular was very underrated imo, and should've been kept as is. Earthborn Keeper: Does the Attack increase stack? Also, what does he keep? Echomaton: Back from the grave! Yay! Eternal Sword: I was a fan of cost 4 or +1/+1, but this works too I guess. Iron Ogre: Yipee, it's almost the same scroll as it used to be and can still be one-shotted by the Wings Cleaver that succeeded it. Not that I don't appreciate the change, but I sincerely doubt it'll make the scroll more popular. Malevolent Gaze: I'll be replacing this with the new Cursed Presence. Potion of Resistance: It's just that... this was probably the most perfect enchantment I'd run into in all my time as a Scrolldier. Complete immunity is too strong, and cost 2 is unhandy for my DsplashE deck. I'd really appreciate it if this were reverted, even if the reversion (is that a word?) came with a drawback such as "When PoR comes into play, enchanted unit's CD increases by 1." Power Trip: If you've already gotten to 8 Energy it's unlikely that you'll need this, but any buff is good, no matter how small. Wings Sorceress: Since you're putting in another 3/2/3 Ranged unit, can you give Boom Reaver Ward or something? Test Server: Please don't make me go through the trouble of setting up a virtual Windows machine on my Mac just so I can access this thing once a week. I can't stand hearing about all this stuff and not being able to access it. I take this as an attempt to foster subtype-based wild decks (as for beasts and gravelocks), lategame order and aggro decay. Looks cool! Some of your Lore (flavour text) is very long. Use Snargl Brain as the example, it takes up 4 lines which is as much as the long description already on the scroll, together they fill up the entire scroll with text. 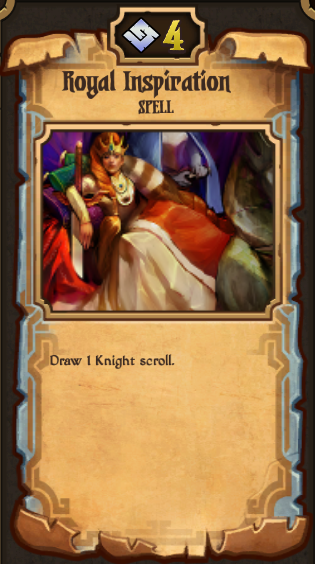 When i run through the deck builder I often over-look scrolls with a lot of lore (text). Snargl Brain's lore is funny though, so keep up the good work. There are a lot of 2/2/3 creatures with 2 cost, it's noticeably repetitive. Nog & Gravelock Raider were added to the ranks of Kinfolk Ranger, the infinite Gun Automatons, Bog Hound, Infected Gravelock, & Tool Initiate. I'm trying to not get caught up in balance. Gravelocks are very scary, melee vs ranged has been a deterrent due to the low amount of creature options in energy, but this is changing fast. Royal Inspiration seems unplayable at a first glance, 9 resources for a royal vanguard, resonance helps a little. I'm not really a fan of the draw a specific scroll effects, they are usually just a means to make decks smaller or to repeatedly use powerful combo's (Summons for puppet soldier). And i'm a little confused with the balance standards. 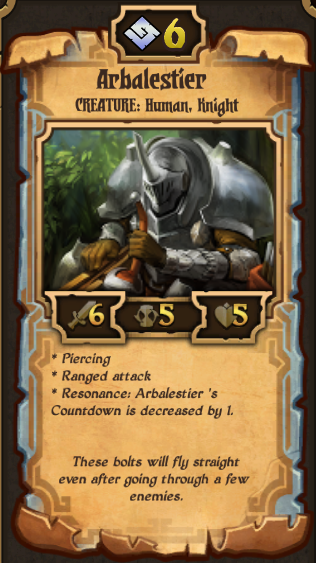 Relentless is one of the strongest passives in the game, a royal skirmisher which is 3 cost for 3/2/3 relentless costs the same as a 4/2/2 mudo fighter while 2 health is usually considered unplayable. 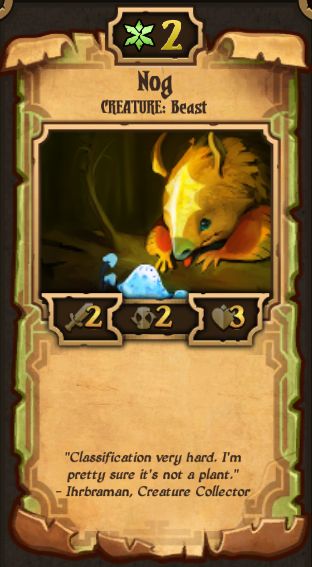 Giving more attack to a lower health creature would help make the scrolls viable as hard hitters. You can also give 3 cost creatures 4/2/3 & they would only be as strong as a skirmisher or breaker, still weaker than rot-eaters. I personally liked machine priest the way it was. energy needed the heals and displace made for cool plays. I would like the new one thou. maybe a new scroll or new type of machine priest. also why change corrode? it was fine and kind of needed in energy. Honestly I'd rather have seen Fulmination Conduit cost 2 than start at 2 CD. The main problem with it, I think, is that playing it as a 3-cost gives it a very very very awkward timing. There is so much I like: Beasts, Bunnys and Graves. The last patch was about promoting enchantments. 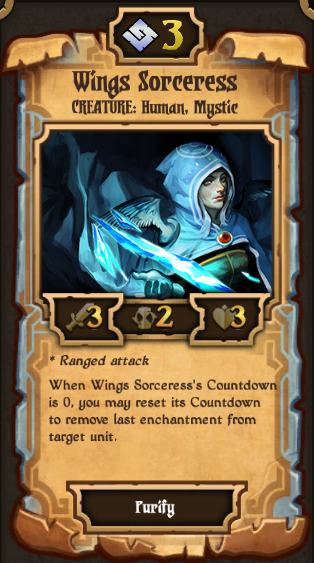 but now "Wings Sorceress", she means eternal Enchantment denial, with no drawbacks, as she can attack also. Maybe she should only be able to target own units. Even worse "unbind" now is an agressive purification, this scoll mustn't exit. Wings Sorceress would - probably - not remove an enchantment each attack. Those 3 attack can often kill a unit, and in many cases that is at least as preferable. In many cases it will be similar to the Scholar, as isn't always obvious if you should use the ability or attack. Bit soon to tell how it will play out though..
Enchantments have always had a risk - to many eggs in a basket. Units are volatile, and does not survive for long. That mechanic is changing, as units are (slightly) harder to kill. Enchantments make them even harder to kill. 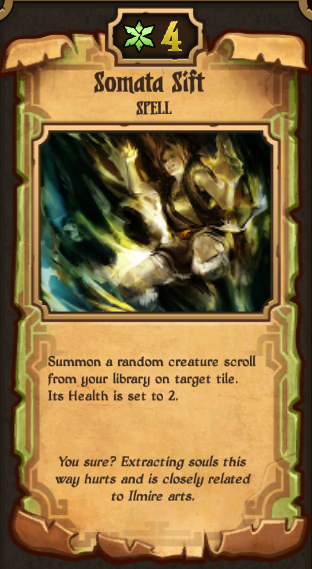 Purification, Unbind, the new sorceress and probably even more scrolls gives an alternative to unit removal. They pull the teeth out of the 8-1-10 super unit. 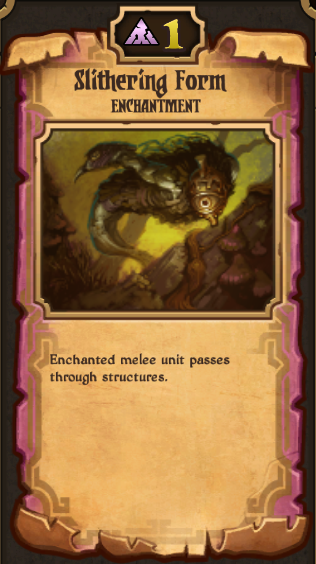 Without any direct enchantment interaction especially Order would have big trouble getting rid of a unit like that. 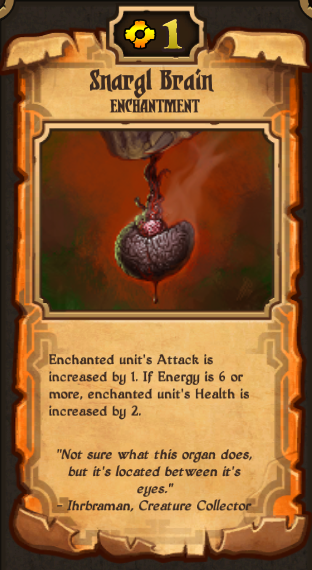 Unbind in Decay allows poison to work on a unit enchanted with Magic Armor. I see no problem there.